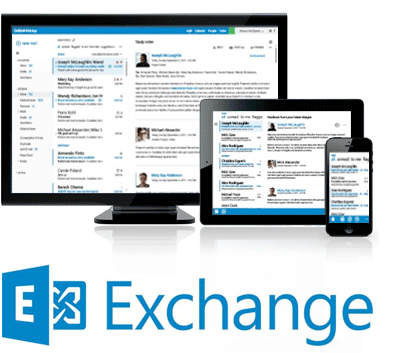 Start enjoying the benefits of mobility today with Cloud E-mail with Hosted Exchange! US BASED SUPPORT! No more dealing with off shore support! SIGN UP NOW AND GET 30 DAYS FOR FREE! By using Hyper Media’s hosted Microsoft Exchange email service, you and your company will be able to leverage the cloud-hosted features to benefit your organization. * 3 year agreement, extra space $1.00 per month per additional 1 GB of space, billed annually. May not be combined with other coupons. Please contact us for more information at 410-752-9000 x350. Work Anytime, Anywhere with hosted email: Get full access to all of your email folders, contacts, calendars, and files from any Microsoft Outlook or browser, from anywhere, anytime! Keep Up to date: Any changes made to your emails, contacts, calendar and files in any medium (such as Microsoft Outlook or Web Mail based browser access, smart phone, tablet) are kept up to date when accessed via any other medium. Stay Connected: Carry your contacts, calendar, notes, emails and task list on the road in your Laptop, Tablet, Android Phone, iPhone, Windows Phone 7 and other popular smartphones. Work Offline: work on your email, change contacts, schedule meetings and modify files even while disconnected from the Internet. Outlook can keep an offline copy of everything; any changes made in offline mode are synchronized. Schedule meetings with your co-workers within moments by viewing everyone’s busy and free times and picking the time that will work for everyone. Administrative assistants can view, add, change, and delete appointments on other users’ calendars. Eliminate scheduling conflicts for resources such as meeting rooms and equipment. Share files, emails, contacts and calendars across the company, department, or project — all through easy-to-use Microsoft Outlook. Spam filters: Unwanted emails cause hours of lost productivity. Our client-side spam filtering will filter out the unwanted messages before they get to your mailbox, saving you time and aggravation. Increase your productivity today with our 30 day NO Obligation offer. * Fees are billed on a quarterly basis. Any storage overage is billed at $ .50 per GB/mo.